Twenty-five years after its original publication, Do I Have to Say Hello? 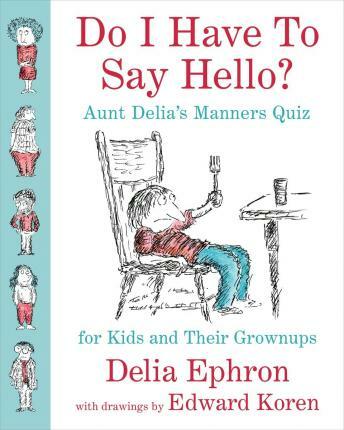 Aunt Delia’s Manners Quiz for Kids and Their Grown-ups is back, and do we and our kids all need it. In a series of light-hearted multiple choice quizzes, alternate scenarios, and true-or-false questions, Delia Ephron and Edward Koren, the author and illustrator team who brought us the best-selling How to Eat Like a Child, depict a range of possibilities that reflect life as it is as well as life as it ought to be. Covering table manners, car manners, playground manners, school manners, and more, this is a book that is sure to delight (and horrify) adults and children of all ages. Aunt Delia knows what makes the difference between a pleasant and an excruciating visit to a friend’s house in the company of a young child. She knows the proper order in which the following actions take place: (a) Throw up; (b) Get out of the car; (c) Ask Uncle Jerry to pull over. In short, she is practical and basic: she does not get into fish forks, but she knows what to do with bubble gum. She also deals with such things as kindness, sharing, consideration, generosity, and diplomacy. Delia Ephron’s painfully on-target text is complemented by Edward Koren’s hilarious drawings, which–as ever–present us not as we might wish to appear, but as we really are.